Trim the state budget, cut … the state supreme court? Cutting four jobs in state government might not seem like it would be a tremendous cost savings to taxpayers. But, what if these are the highest paid elected state employees (along with the governor) in Washington? Three Republican state senators have introduced a bill in Olympia that would cut the state’s supreme court from nine justices to five, the Associated Press reported last week. Republican Sen. Michael Baumgartner of Spokane points out the state’s constitution only mandates we have five justices. But the effort comes (suspiciously) following the high court’s ruling that voter-approved initiatives requiring the legislature to have a supermajority to pass tax increases is unconstitutional. Supreme Court justices earn more than $164,000 a year. Baumgartner said that by reducing the court, you also reduce salaries that need to be paid to their clerks and other staffers. “There’s a lot of school teachers you could hire with these salaries,” he said. Sen. Doug Ericksen of Ferndale and Janea Holmquist Newbry of Moses Lake have signed on to the bill, a well. Just doing the straight math here: that would be a savings of $656,000 a year. Do you think this is a good idea in any way or perhaps a veiled effort to get back at the court? On the Washington state supreme court, you’ve gotta step aside at 75. And with Justice Gerry Alexander retiring at the end of this year, it was time for Gov. Chris Gregoire to appoint a temporary justice until the next election. Tuesday, she chose Steven Gonzalez, a King County Superior Court judge and former federal prosecutor. Gov. Locke appointed Gonzalez to the King County Superior Court in March 2002 and voters elected him that fall. He was re-elected in 2004 and 2008. From 1997 to 2002, Gonzalez was an Assistant U.S. Attorney in the state’s Western District. Assigned to the major crimes division, his work included the notable case of U.S. v. Ressam, in which Ahmed Ressam was tried after being captured in Port Angeles in 1999 en route to Los Angeles, where he planned to detonate a bomb at the International Airport. Gonzalez gave the prosecution’s opening statement and examined nearly 70 witnesses. He also worked in the City of Seattle Attorney’s Office from 1996 to 1997 as a trial attorney in the domestic violence unit. Before that, he practiced business and civil law with the firm Hillis Clark Martin and Peterson from 1991 to 1996. Gonzalez chairs the Washington State Access to Justice Board, a position to which he was appointed by former Chief Justice Alexander. He co-chairs the Race and Criminal Justice System Task Force. From 2006 to 2010 he co-chaired the Court Security Committee for the State of Washington. The Washington State Bar Association recently presented the 2011 Outstanding Judge of the Year Award to Gonzalez, along with Judge Mary Yu, citing their work on promoting equal access to the courts, including developing helpful materials for self-represented persons. In addition to his impressive judicial background, Gonzalez has worked in the community for the past 20 years. He served on the Board of Directors of El Centro de la Raza and on the steering committee of the Northwest Minority Job Fair. Before becoming a judge, he volunteered as a pro bono attorney for the Northwest Immigrant Rights Project. Gonzalez earned his J.D. from the University of California at Berkley’s law school and was admitted to the Washington state bar in 1991. He graduated from Pitzer College, a member of the Claremont Colleges, with a B.A. in East Asian Studies and studied abroad in undergraduate and advanced studies in Japan and China. In May 2011 he was awarded an honorary doctorate of law from the Gonzaga University Law School, where he gave the commencement address. Gonzalez will begin to serve on the Supreme Court in Jan. 2012. He is married to Michelle Gonzalez, assistant dean at the University of Washington Law School, and they reside with their two children in Seattle. Turns out Washington’s not the only state where issues over medical marijuana are being litigated. The American Civil Liberties Union earlier this month filed an appeal to a federal judge’s decision to throw out a Michigan case of a medical marijuana patient fired from Wal-Mart for his use of the drug. In January, we covered our state supreme court’s hearing on a similar case in which a woman was fired from Teletech in East Bremerton for using medical marijuana to relieve migraine headaches. The woman is authorized under law to use medical marijuana. She sued; her case was thrown out at the county and court of appeals level and it was taken for review by the state’s highest court. We are still awaiting their opinion. GRAND RAPIDS, MI – The American Civil Liberties Union today said it will appeal a decision by a federal judge to dismiss its lawsuit filed in June against Wal-Mart and the manager of its Battle Creek, Michigan store for wrongfully firing an employee for using medical marijuana in accordance with state law. The patient, Joseph Casias, used marijuana to treat the painful symptoms of an inoperable brain tumor and cancer. Michigan voters in 2008 passed the Michigan Medical Marihuana Act, which provides protection for the medical use of marijuana under state law. But in a 20-page ruling today, U.S. District Court Judge Robert J. Jonker said the law doesn’t mandate that businesses like Wal-Mart make accommodations for employees like Casias, the Battle Creek, Michigan Wal-Mart’s 2008 Associate of the Year who was fired from his job at the store for testing positive for marijuana, despite being legally registered to use the drug. In accordance with the law, Casias never ingested marijuana while at work and never worked while under the influence of marijuana. The ACLU will appeal today’s decision to the U.S. Court of Appeals for the Sixth Circuit. To take a look at the Kitsap County jail’s old and updated policies on earned release time, scroll below. I have also posted the landmark ‘good time’ decision by the Washington Supreme Court that directs how Department of Corrections and the local jails work to calculate good time. Benham, a four-term justice on the Georgia Supreme Court, is a trailblazing judge whose record reflects his belief that public service can highlight and help correct injustices — such broken spokes — in communities. Benham, here in Bremerton Saturday to speak before a crowd at the local NAACP chapter’s annual freedom fund event, broke many barriers: He was the first African American to establish his own law practice in his home county. First to be elected as a court of appeals judge. And then the first to serve on Georgia’s highest court. Now 63, Benham leads by example. You name it, he serves on the board. He started a “comprehensive legal education program,” which has helped more than 200 minority students go to law school. 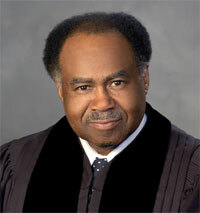 He’s been honored with more than 400 awards, and the State Bar of Georgia’s community service award bears his name. Ebony Magazine named him one of the 100 most influential blacks in America. The result of a little networking last year brought Benham to Bremerton. Bremerton NAACP Chapter president Joan Ferebee and second vice president Denita Harden-Patton met Benham at the NAACP’s centennial celebration in New York in February 2009. Ferebee and the judge exchanged cards at that time. Early this year, Ferebee asked if he’d come — and Benham accepted. Ferebee said in no uncertain terms that the justice is the cream of the crop in terms of guests they’ve hosted. “He ranks at the top,” she said. Benham will speak at 7 p.m. tonight at the Comfort Inn and Suites Olympic Ballroom, 5640 Kitsap Way. Tickets are $50 for adults and $25 for youth ages six to 13. The dinner also includes dinner and dancing. It’s quite the rarity when a justice of the Supreme Court of the United States makes the trek to a town such as Poulsbo. 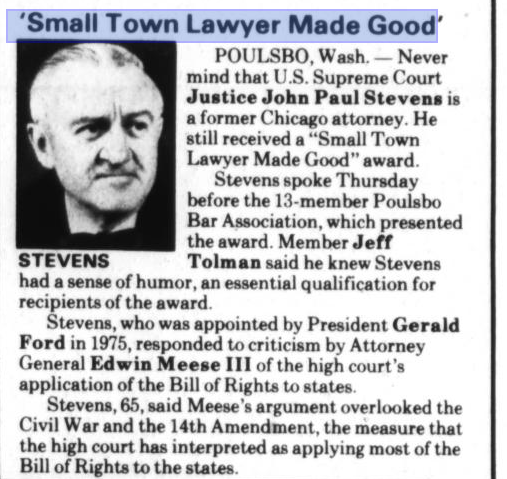 But in 1985 and for the benefit of, among other things, the small town lawyer, Justice John Paul Stevens and his wife, Maryan, came to Poulsbo. Stevens, who last week announced his retirement from the high court after serving the fourth longest term in its history, was invited to come by a group of nine Poulsbo attorneys who comprised what they called the Poulsbo Bar Association. It was a shot in the dark, recalls Jeff Tolman, of longtime Poulsbo firm Tolman and Kirk. But after some letters of correspondence, Stevens agreed to come, Tolman said. And so the bow-tied, horn rimmed justice flew to Seattle with his wife, and Tolman, his law partner Mike Kirk, and now-Kitsap County Superior Court Judge Jay Roof went to the airport to pick him up. There was no security — they drove a suburban and whisked him to Big Valley Road for a stay at Manor Farm. “He seemed to be the type of person that could understand justice could occur in rural areas,” Roof said. They took Stevens for a sailboat ride on Puget Sound before Stevens received the award before a packed 300-room Sons of Norway hall. Justice Stevens said he’d expected a town that was drying up and empty, Tolman recalled. Instead, he said that “Poulsbo is a postcard on the water.” It was a well received remark. 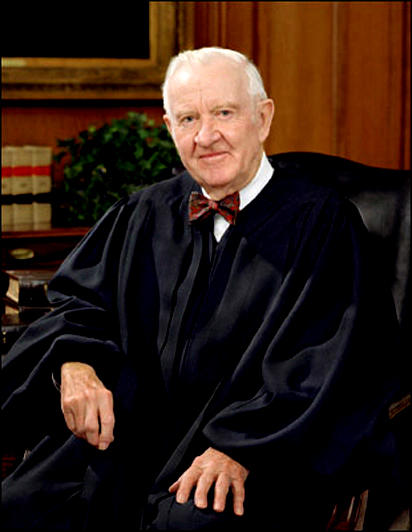 Tolman added that only about three years later, the same award was given to Justice Antonin Scalia, who also came to Poulsbo. “During my clerkship interview with Justice Stevens, we talked about our hometowns. When I mentioned that I had grown up in a small town near Seattle, he leapt from his chair and pulled a plaque off the wall. It read: “Small Town Lawyer of the Year: Associate Justice John Paul Stevens.” It had been given to him a few years before by the bar association of Poulsbo, Wash.